Unfortunately, the season doesn't end happily for everyone. While the number of boating related fatalities has decreased over the last 10 years. 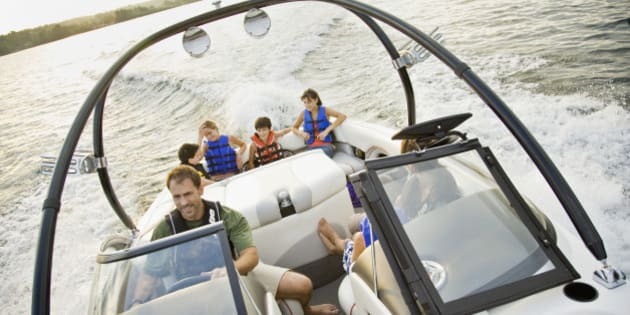 According to Canadian Red Cross statistics, an average of 125 Canadians die each year while boating. Ian Gilson Director of the Canadian Safe Boating Council and a boating enthusiast. Ah, long days, warm breezes and vacation time soon upon us. June is a special month where winter is a distant memory and boating season is ramping up. It's a time that I wait for with great anticipation. When I finally step back onto my boat, a 21- foot sport boat, I get an overwhelming feeling like I'm home again. As a family of five with three daughters--we have ample opportunity to fish, water-ski, cruise and enjoy leisurely times at anchor on beautiful sunny days. Many Canadians enjoy boating each summer. Unfortunately, the season doesn't end happily for everyone. While the number of boating related fatalities has decreased over the last 10 years. According to Canadian Red Cross statistics, an average of 125 Canadians die each year while boating. As a Director with Canadian Safe Boating Council, I am saddened to see that the vast majority of these fatalities are preventable. Boaters take unnecessary risks while on the water by not wearing their lifejackets or thinking that boating and alcohol go together. I was recently speaking with a gentleman who knew that I was an avid boater. He mentioned that he was once a boater himself and reminisced that there was nothing better than to grab a few beers and head out on the water. Yikes! I took comfort in the fact that he was no longer boating but was reminded that approximately 40 per cent of boating related fatalities involve alcohol. I know that I wouldn't be able to live with myself if I had injured or killed someone because I was boating while impaired. Distressingly, I don't see people wearing their lifejackets in small open boats or children wearing them but not adults. Parents must remember they are role models for their children -- when kids see adults wearing lifejackets, it signals to them that this safety precaution is necessary for everyone, not just children. Many people assume, if they can swim, they don't need a lifejacket. In my mind, I still think I'm as strong a swimmer now as I was in my 20's but I'm afraid that isn't the case. Looking at the statistics, you'll find that in over 80 per cent of boating-related fatalities, the person who died weren't wearing their lifejacket. Reckless behaviour and risk-taking can result in unforeseen deaths. One practice that is unnerving is children sitting at the bow with their legs hanging over the edge of a moving boat. Even if there is something to hold onto, a single moment of inattention combined with an unnoticed wave or wake from another boat can cause the child to fall into the water. It doesn't matter how slowly the boat is going, the child can be easily injured or killed by the propeller. I urge my fellow boaters to get out on the water as much as you can this season because, in much of Canada, the season is short. But be careful. Make sure you have all your safety equipment on board, wear your lifejacket properly and leave your favourite alcoholic refreshment for when you're back at the dock.